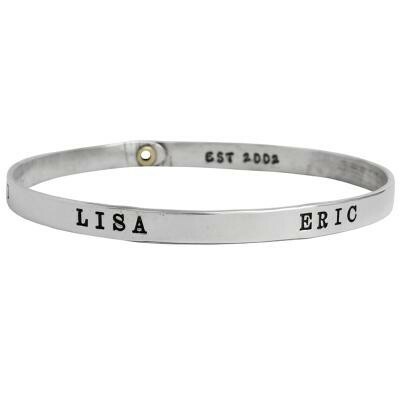 "Custom Family Bangle Bracelet for Four Children, Silver"
Celebrate your family with the Family Bracelet. Add on names,nick names, dates or meaningful words.... whatever makes it special to you. The price listed is for one inside stamp and four outside stamps. For the mother of four customize the inside with your last name, "Team (last name)", anniversary date or just a word that is special to your family. On the outside put the parent's and/or the children's names. You can also include words such as LOVE and FAMILY. Be creative and design a bracelet that is meaningful to you.